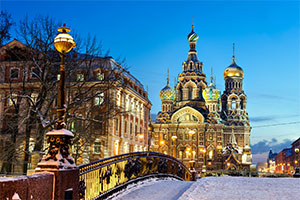 We will fly first to St. Petersburg, Russia, which was once capital of Czarist Russia. We will visit the Czar’s palace and the Hermitage art museum (which houses Rembrandt’s The Return of the Prodigal Son), enjoy walking and/or boat tours of the city, experience Russian Orthodox worship, and have free time to visit other sites. From St. Petersburg we will train to Tallinn and Riga, taking us into Estonia and Latvia. We’ll experiment with a medieval dinner in Tallinn. We will see Riga’s medieval old town. We will explore dreadful marks of history, including a World War II concentration camp and the Museum of the Occupation. In Klaipeda, Lithuania, we will make connections with European students at LCC, the only Christian college in eastern Europe. From Klaipeda we will make a day trip to Kaliningrad (over the border into Russia again), the city of Immanuel Kant. We’ll have a beach day (a chance to compare a Baltic beach with the Oregon coast) and opportunities to eat Lithuanian food. We will experience worship in a Roman Catholic church. From Klaipeda we will train to Berlin, Germany. We will visit the Kaiser Wilhelm church, remnants of the Berlin wall, the Holocaust Memorial, and the Brandenburg Gate. We will meet with prominent government officials. Students will have free time to explore many other sites. Next: train to Leipzig, site of a church that played a large role the “revolution” of 1989, when the government of communist East Germany was confronted by huge crowds wielding candles and prayers. While in Germany, we will experience worship in a Protestant church. Our last stop will be Copenhagen, Denmark, home of Soren Kierkegaard and Hans Christian Andersen. We will visit sites relevant to Kierkegaard’s life, the 17th century Rosenborg Castle—and the Tivoli Gardens (a 19th century amusement park). Students will have free time to see other sites—and for reflection on their experiences on the trip. Day 1. Arrive in St. Petersburg. Settle in. Area tour. Dinner. Day 2: Walking tour of St. Petersburg and boat tour. Hermitage. Day 3: Russian Orthodox service in Kazan Cathedral. Spilt Blood Church. Students will have option of viewing Russian ballet. Day 4: Free time: students may take the Dostoevsky tour, visit St. Isaac’s Cathedral, or visit other locations. Train to Tallinn/Riga. Day 5: Arrive Tallinn. Walking tour of city. Medieval dinner. Day 6: Church service (if Sunday). Bus to Riga. Visit Salaspils (concentration camp) on way. Evening in Riga. Day 7: Riga walking tour. Museum of Occupation. Day 8: Free time in morning. Train/bus to Klaipeda. Stop at Hill of Crosses on the way. Arrive LCC. Day 9: Cross cultural seminar with LCC students. Klaipeda walking tour. Day 10: Day trip to Nida, Sand dunes on the Baltic Sea. (Days 10-13 will include informal opportunities to interact with LCC students). Day 11: Lithuanian traditional food tasting. Palanga Amber Museum. Afternoon at the beach. Day 12: Day trip to Kaliningrad & back. Kant sites. Day 13: Church service (if Sunday). Free time: dolphinarium, sea museum, sauna, rest. Day 14: Train to Berlin. Settle in. Kaiser Wilhelm Church. Berlin wall. Day 15: Explore Berlin. Free Time. Interview with Angela Merkel assistant. Day 16: Train to Leipzig. Visit 1989 church. Day 17: Leipzig. Free time. Day 19: Copenhagen. Tivoli Gardens. Kierkegaard sites. Rosenborg Castle. Day 20: Copenhagen. Church Service (if Sunday). Free Time.